Courtesy R.V. Service provides quality mobile R.V. maintenance, repair, and installation at competitive rates. Our technicians are LP Gas Certified and Licensed. We'll bring the R.V. repair shop to you, at your home, R.V. park, storage facility, even highway rest areas, WHENEVER AND WHEREVER YOU NEED R.V. SERVICES. We accept insurance, warranty, and extended warranty work and we process all the paperwork for you. Just let your technician know that you have an extended warranty or are covered by insurance when you schedule your appointment, and we will call the warranty company for prior authorization and let you know before we do the repair, exactly what is going to be covered and what your out of pocket expense will be. NOTE: The customer is responsible for any charges not covered under warranty including, but not limited to, deductible, service call, freight charges, and shop supplies. To minimize repair time, our service trucks are stocked with a variety of inventory parts. 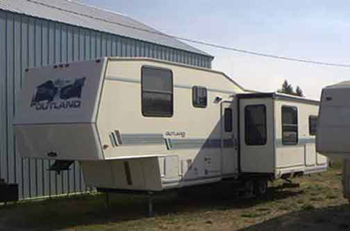 We service all makes and models such as Winnebago, Jayco, Fleetwood, Forest River, and all others. *In addition to our basic services, we also pack wheel bearings, install hitches, and perform pre-delivery inspections. For our current labor rates and service call charges please call our service department at . Or click here to contact us.